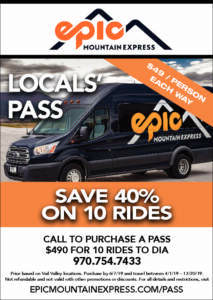 Epic Mountain Express’s best deal is on now! Purchase 10 rides for $490 by June 7th to save on Airport Shuttles. Travel is valid through December 20, 2019 and rides can be used for friends and co-workers. Pay just $49 per trip to Denver International Airport to/from the Vail Valley. There isn’t a better deal for an airport shuttle that brings you right to your home. Call to Purchase your Pass – 970-754-7433 (SKI-RIDE). Reservations are open 6am – 10pm daily.